Yesterday, the Pope closed out the annual plenary of the Pontifical Council for the Family, this year devoted to the theme of "Grandparents: Their Witness and Presence in the Family." The theme you've tackled is very close to us all. Who doesn't remember their grandparents? Who can forget their presence and stories around the family fireplace? How many among us carry their names as a sign of recognition and continuity! And the family custom, after their passing, to recall their anniversaries with the celebration of Mass on their behalf and, if possible, with a visit to the cemetery. These and other acts of love and faith are the manifestation of our gratitude for them. They gave themselves for us, sacrificed themselves, in some cases even to the point of giving their lives. As regards the family, grandparents continue to be witnesses of unity, of solid values of faithfulness and that singular love from which faith and the joy of living flow.... In the face of the crisis of the family could it not be time to draw even more upon the presence and testimony of those -- grandparents -- who have a greater richness of values and experience? We couldn't, in fact, plan the future without recalling a past characterized by significant experiences and spiritual and moral points of reference. 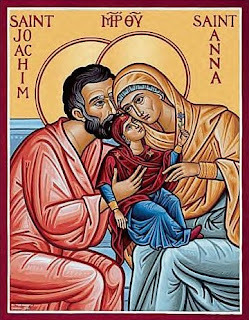 Thinking of grandparents, of their witness of love and faith to live, there come to mind the biblical figures of Abraham and Sara, Elizabeth and Zechariah, of Joachim and Anne, just like the elderly Simeon and Anna, or even Nicodemus: in every age, all of these recall for us how the Lord asks each to bring their own talents. Another part of the PCF plenary involved further planning for next year's 6th World Meeting of Families, scheduled to take place from 13-18 January in Mexico City. In an interview with Zenit, the Mexican capital's archbishop Cardinal Norberto Rivera Carrera indicated that Pope Benedict "desires" to attend the gathering. As many of you know, the sentiments expressed above resonate especiallly clear on this end. To no small extent, it's humbling to admit that more than any appointment, document, vestment, pronouncement -- for that matter, any other "-ment"... or anything else -- the question I get asked most frequently is "How's the Boss?" For any newcomers, "Boss" is the (self-conferred) moniker of my 91 year-old maternal grandmother -- an orphaned immigrant from the Bel Paese who was widowed before she was 40, worked three jobs to raise seven kids, raised me after my Mom went back to work and, in sum, continues to teach me more than any teacher I've ever had in this life... and is the first source of whatever is good in me. I can't say enough thanks for all the closeness of thought; whether it's come on the road, over the phone, through SMS or e.mail, it always means the world. As for an answer -- and here I need to ask forgiveness for not being able to stay on top of the notes as I'd like -- it honestly depends on the day. Gram's eyesight has worsened significantly over recent months, but even though she can still see (and, yes, count) money (which, as she's long maintained, "makes the blind see and the lame walk"), the most worrisome thing has become that, ever more frequently, she doesn't even realize she's in her own home of six decades, where my Mom and her sisters, in the greatest testimony of love and appreciation I'll ever know, have spent close to three years caring for Boss on rotating 24-hour shifts. Then again, even though she might not be able to put on her shoes, walk more than 15 feet or stand up on her own anymore, don't be fooled: she's still completely in charge... blunt tongue and all. Before leaving for a recent work-trip, I stopped by to see her before heading out, and while telling her that I'd be away for a few days (and asking her to wait for me 'til I got back), she immediately looked at my mother, shooting a pointed finger her way. "You -- give him $10," she ordered in her usual "broke English." "Give it now. He buy lunch. From me." She wanted it done in her sight to make sure it happened... and, no, she didn't arrange to reimburse Mom. Wouldn't have it any other way, of course. But the thing is, for all her gifts and all her faith, Boss' one great human trait is her vanity. "You write my book," she says, often. "It'd be the best story anybody ever heard." If you're not listening as you should, she'll say it. If you don't treat her like she's in command, you'll hear about it. And she even takes to knocking her preacher-son down a notch, noting every so often that "He won't let me preach in his church, because I preach better than him. You watch." She's told me countless times what love is -- "is understanding, is forgiving, is giving, is sacrifice" (her emphasis) -- and what's more, for all her adventures in panache, she's lived it to the hilt. But almost as if she hadn't already made enough of the latter, it would seem she's been called upon to make a final offering in life: that very confidence and pride of self-sufficiency that's gotten her over no small number of hurdles through the years. By and large, though the loss of this has never been easy on her, often bringing her to tears when she thinks no one's looking, it's just the latest challenge she's faced with acceptance, superhuman strength, and even, in the better moments, joy. And just as with every other sacrifice of the past, it is a grace given out of love for the rest, its richness impossible to measure. To the last drop, it's as beautiful a testimony as it can sometimes be painful... then again, finding the beauty in the cross is what, at its core, this faith -- this life -- is all about. For the grace of being able to remain here through it all, I need to say an enormous "thanks" to all of you -- not just for the kindness of asking after Gram and your prayers, but truly for the support and strength so many of you have sent my way over time in every form imaginable. On multiple levels, candidly, keeping this work afloat hasn't been easy; making ends meet is always a struggle. Yet while some very kind, even lucrative, offers have come in from elsewhere and, on a professional level, the prospect has often been all too tempting to leave Philadelphia behind, I was blessed to be raised with the knowledge that some things are more important than that thing they call a career. Long ago, I made a promise to myself to be with the Boss so long as she's here -- where it counts, nothing else matters... and, in all honesty, I ain't got a regret in the world. But I never could've finagled it alone. Thanks to all of you, I've been able to pull through and keep plugging away from where I've needed to be, the only place I really could imagine being through all this. In every sense, it's made all the difference, and no words could ever say how great a blessing this has been and remains. Everyday. Forgive me if it sounds big-headed, but I know it to be true that, tough as it is, she's hanging on for me, and all of you have allowed me to hang on 'round these parts for her. It -- she -- remains my sanity, my greatest grace, my daily classroom of perspective, sanctity, goodness and honesty, and the ability to swing it the only way it could be done is this readership's greatest gift and blessing to me. As the Boss herself often puts it when recounting her story, "By hook and by crook, we made it".... Well, at least this far. And, literally, all by the faith she taught me. Eternal thanks from a grateful scribe... and an even more richly blessed grandson. On a final note, Boss is exceptionally lucky to be surrounded constantly by love. Sure, she's worked for and earned it... but there are a lot of others who have, too, who don't have the same gift of company. They might be our parents, grandparents, an elderly or simply "down" relative or friend -- maybe someone who's recently lost a spouse or child -- and, of course, we can't forget our retired or ill priests and religious, who have served so well and literally given everything to do so for the good of us all. Folks, they're all around us, they need us -- and such is their selflessness that they'll rarely, if ever, say so. I didn't write about it at the time, but last Christmas Eve found me in the hospital at the Boss' bedside. It was another close call -- a bout with pneumonia that took her away from her favorite night for the second time in the last three years. Suffice it to say, may you never have to spend Christmas Eve in a hospital... not just for the sake of someone you love, but to see so many made to go without. It will shake you up and then some, and hasn't left me since. Walking to Gram's room, I couldn't help but look in the other doors along the way and notice so many patients all alone in their beds, almost writhing with a loneliness and heartbreak you could feel a full ten feet away and almost cut with a knife. In the eeriest of ways, the usually-frenetic hallways felt like a ghost-town, filling the place with a sense of despair, of sadness and pain that was, in a word, brutal, especially given all the lights and celebrations going on in the streets outside and streaming over the TVs. Thinking about it later, I couldn't help but try to figure out what it was that they were looking for.... And, well, the answer was right there: it might've been 24 December, but in the purest sense of it, they were still waiting for Christmas -- not wrapped gifts, lavish rituals, beautiful music or decorations on trees, but simply the loving, comforting presence of God in a human touch. And just as the Holy Birth took place under the most disheartening of settings, I couldn't help but think that if it were going to happen again, it'd happen where it was expected least but needed most -- in those very hallways... and not just because the maternity ward was a floor down. At that very hour, a message given half a world away reminded a wider audience of much the same thing: "it is not written: ‘The Lord is close to those who dwell on the heights or on the mountains’, but rather: ‘the Lord is close to the brokenhearted.’"
Bottom line, gang: it might be the Third Sunday of Easter... but there are still a lot of folks waiting for Christmas, right in our midst. It's very easy -- all too tempting -- to spend our time getting distracted, complaining, putting the hard stuff on someone else or reaching for the little things while missing the big ones right in front of us. But the thing is, not just on Christmas Eve is there a world out there, all around us, that suffers alone and in silence. No single one among us can transform it or make it all better on our own. Yet one by one, what we can do is remember, maybe a bit more than we sometimes have, that the gift it's looking for isn't something to fall out of the sky or come wrapped in shiny paper, but the very present of what we each see in the mirror... and all it takes to give it is a call, a note, a surprise pop-in, a pinch of time and a bit of heart... everything else is but an added bonus. Church, we can do this. If anything, it's what each of us are called to do. And to those among us who lead us by example in making that gift of Christmas happen everyday out there for the folks who need it most, thank you. Buona domenica and a continued Happy Easter to each of you, those you love and those you serve.... Pray for the Boss and, if you've got an added space, for me.... as always, a ton of thanks and prayers -- today and always, God love you all.